What do you think of when you hear the word “farming”? Most of us would think of well-fed animals, crops, flashy stainless steel, and industrialized machinery . . . maybe even apple-picking or egg-collecting. We would hardly think of school payments, clothing, or life-saving nutrition. But that’s exactly what farming means for people living in impoverished countries. 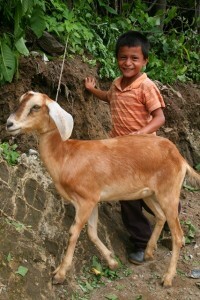 Healthy agriculture and livestock yield food for children, wool for families, reliable income, stimulated local economies . . . the difference between starving and prosperous communities. Simply put, successful farming means the difference between life and death for thousands of people in remote areas of the Nepali mountains, isolated desert terrains in Zimbabwe, or the jungles of South America. And together, we can provide poor communities with the tools they need to not only survive, but thrive! Resources like fruit trees, cows, greenhouses, harvest-producing seeds, sheep, and so much more. Will you join us as we invest in the sustainable health of those in need around the world? Give through Gifts of Hope and help make a difference that will continue to grow. P.S. There’s still time to purchase items and send a special e-card to your loved ones. Browse through Gifts of Hope online and order your gift today. There’s always a good time to give—especially when it changes lives!